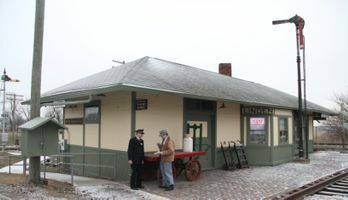 Linden Depot Museum is located in the restored 1909 junction depot built to serve the Monon and Nickel Plate Railroads. Featured exhibits include items from both railroads, as well as historically interesting items from other railroads. A second building houses a large HO model railroad attraction with four operating trains, blimp, trolley, monorail, tunnels and mountains, an animated carnival and an animated circus. Also on display are two vintage N-gauge layouts, circus memorabilia and over 1000 model train engines and cars. Outside are four 100-year old semaphores, a CSX caboose, a Nickel Plate caboose and various railroad signs and signals. 25th Anniversary project is the building of a full size replica of an 1837 Norris steam locomotive which can be viewed outside as construction progresses.